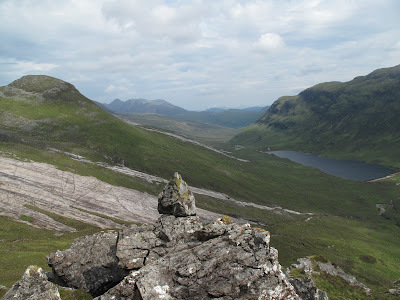 I decided on a through route, starting near Loch a’Bhraoin, taking in the remote summits of Mullach Coire Mhic Fhearchair, Beinn Tarsuinn, A’Mhaighdean and Ruadh Stac Mor before walking back to the road at Corrie Hallie. My main objective was to spend some time on the country so I carried a tent and spent two nights enjoying the solitude of the wilds. 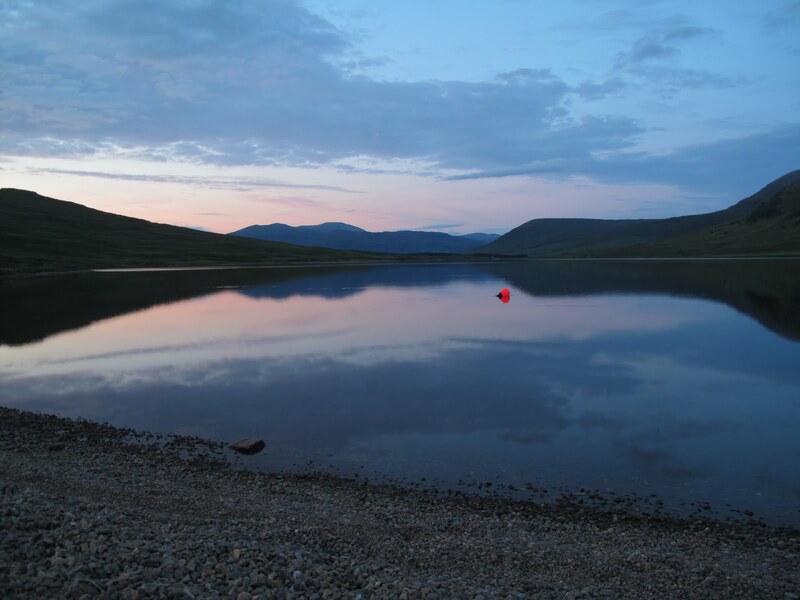 Reflections on Loch a’Bhraoin, 2300 hrs Friday night. The weeks around the solstice are among my favourite of the year. I was heartened to see cattle ruminating on the flanks of the lochside moraines as I walked the shore. It filled me full of nostalgia for the sheiling days of pre-industrial Scotland, when one could enjoy a summer making cheese in a hovel to the melody of lark and pipit. Though I sometimes lament the enforced industry of my current capitalist lifestyle, I would not swap it for transhumance. It is easy to take a rose-tinted look back and see only the availability of leisure time, forgetting that it was tempered with a lack of opportunity and the spectre of famine and disease. That said, our experiment in capitalism has not been in progress long enough for me to be confident that it will prove to be superior in the famine avoidance stakes. A sandpiper accompanied me along the lochshore, shrilly crying in defence of eggs or chicks. 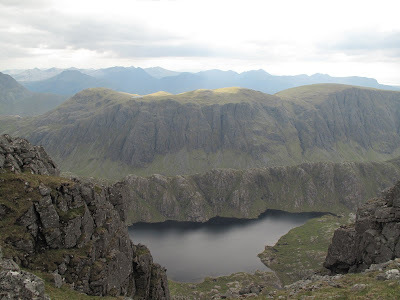 Probably it was a dozen or more working in relay, but so tightly defined were their territories and so smooth were their changeovers that it seemed as if a single bird escorted me for the full 6 km length of the loch. A riot of colour. The yellow is tormentil, if you know the the pink and blue please leave a comment and save me having to look them up. 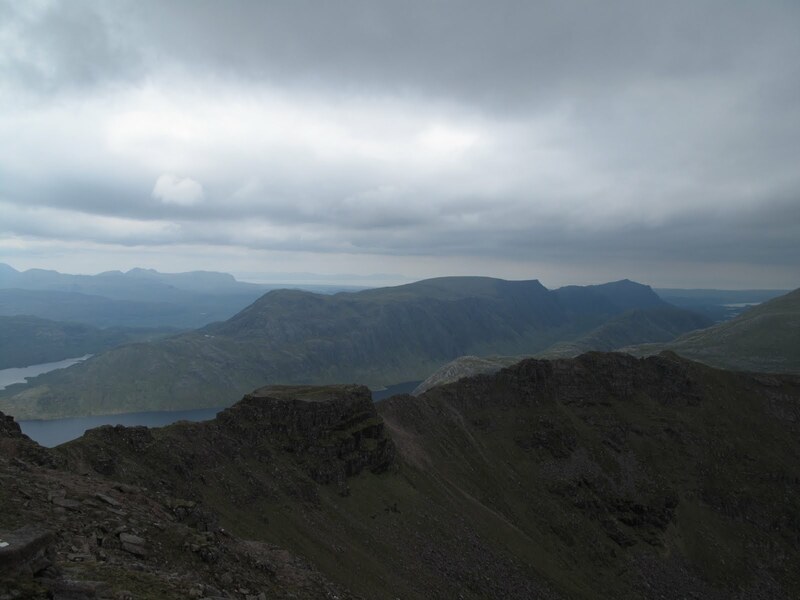 Meallan an Laoigh, Loch an Nid and a distant An Teallach from the east ridge of Mullach Coire Mhic Fhearchair. I was very taken with this island in the sky, a little table-land of Torridonian sandstone on the ridge of Beinn Tarsuinn. If I was a rock star I would take my band up there and shoot a video. Near the summit of a’Mhaighdean looking towards the unusual low ridge of Beinn Tharsuinn Chaol with the great cliffs of Ben Lair and the Torridon hills beyond. A’Mhaighdean summit, where I met a guy who’d run in from Poolewe, the only person I saw all day. View down Dubh Loch and Fionn Loch towards Poolewe. After more than 11 hours on the go I was glad to get my pack off, set up my tent up and get a brew on. Gleann na Muice, An Teallach beyond. 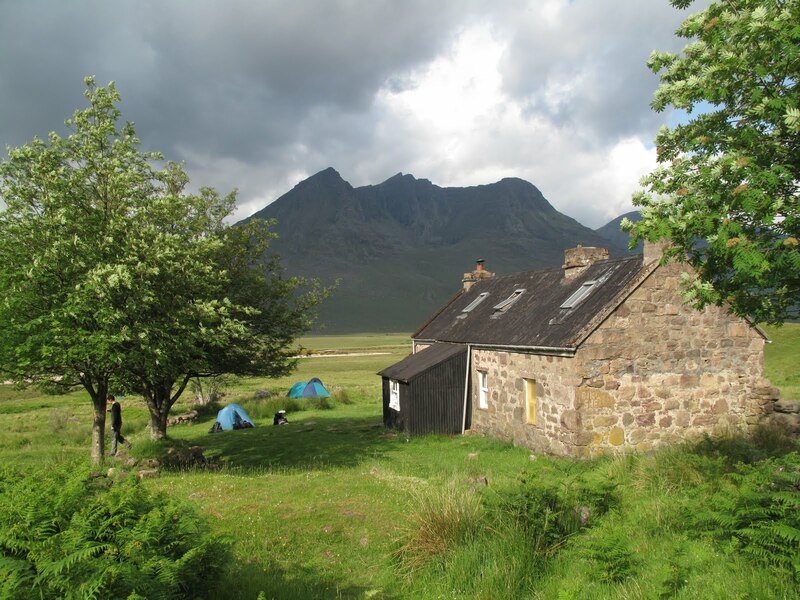 Shenaval bothy on Sunday morning, living up to its reputation as one of the most crowded in Scotland. Beinn Dearg Mor in the background. 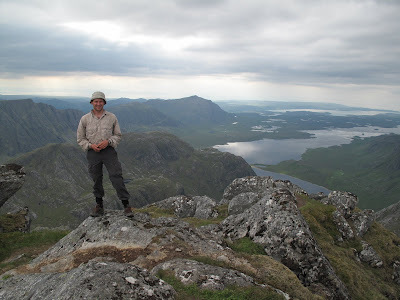 All in all an awesome trip and great to get the Munros nabbed after the weather forced me to content myself with a lesser prize last time round. 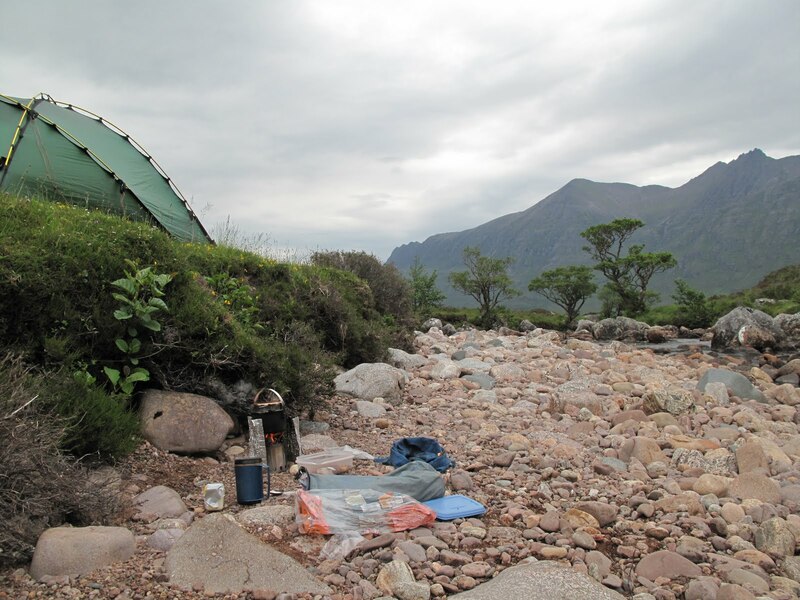 To my great relief the Bushbuddy was a tremendous success – a genuinely viable lightweight alternative to gas, even in the barren Lewisian environs of Fisherfield. 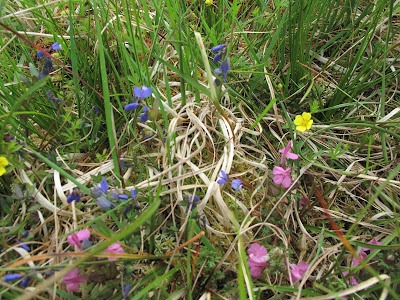 I think the pink is Marsh Lousewort, but I can’t quite make out the blue. Are they tiny harebells? Cheers Tom. I took a close up of the blue ones, I’ll add it tonight and give drop you a line so you can have a look at it. A’Mhaighdean is just fantastic. The whole area makes for superb backpacking and good to see the stove is going to work for you. I’ve added a close up of the mystery blue flower.